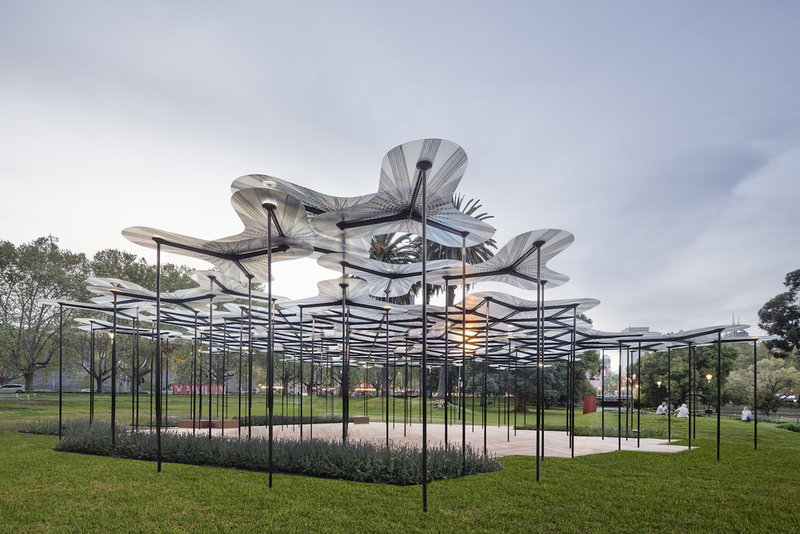 Acclaimed UK architect Amanda Levete – head of AL_A studio, and formerly of Future Systems – has created this year's MPavilion for Melbourne. A futuristic take on a forest canopy, the temporary pavilion forms a welcoming glade for all-comers, hosting a programme of 300 spring/summer events. Inspired by 2015's theme 'Architecture of Wellbeing', it's the second in a series of four pavilions bringing cutting-edge architecture to the city, a dreamy space for a sun-kissed season. One of the things about the Melbourne climate is ‘four seasons in one day’, and we responded to that with our MPavilion. For me the very nature of a pavilion is that of a bandstand. I took this literally, forgetting all about walls and designing something that creates a magical quality of life. We wanted to create a sensation of a tree canopy and play with sunlight, wind and rain. We used the canopy to filter out the harshest summer sun and aimed to add the noise of wind as it passes through. How do you hope people will use and enjoy it? Rooting the pavilion in its parkland setting, I want to create the sensation of a forest canopy in the heart of the city that gives shelter to a programme of events. Wouldn’t it be lovely if, as dusk is falling, there are kids lounging on beanbags while an actor reads them a bedtime story? Then they'll be taken home, falling asleep, in their buggies. That sort of communal storytelling is very powerful. It’s a slightly dreamy experience. What can temporary pavilions bring to a city, and to an architect? The brief for MPavilion 2015 is a great opportunity to design a structure that responds to its climate and landscape. I’m interested in exploiting the temporary nature of the pavilion form to produce a design that speaks in response to the weather. What really drew me to the pavilion commission is the opportunity to do things that you could never do with a building. What were the material or technical challenges involved? I wanted to use a material that is translucent, incredibly lightweight and seemingly very fragile. The construction industry is a fairly slow-moving beast, but Australia has some of the finest boat builders in the world. We worked with a yacht fabricator to employ their boundary-pushing technology, to create something that looks fragile but is actually really strong. The 43 translucent resin petals are reinforced with carbon fibre strands that span up to five metres and are only three millimetres thick. Supported on slender, four-metre-high carbon fibre columns, the structure is designed to sway in the wind, with lighting and a soundscape that activates at sunset. There’s a new Southampton centre I’m creating for UK cancer care charity Maggie’s and our expansion of the Victoria & Albert Museum, the world’s largest museum of decorative arts and design, is due to open in 2017. The Exhibition Road Building (above) will have a new entrance, a 1,500-square-metre gallery for temporary exhibitions and a courtyard all made out of porcelain. Architecture shouldn’t be about playing by the rules. It should be about challenging the brief you’re given, about breaking boundaries. Here is an artistic discipline that involves things like functionality, building codes and planning logistics; it combines everything I love. AL_A is more driven by conceptual thinking than formalism, so it’s less easy to identify an architectural style in what we do now. What binds all our projects together is a very rigorous, but intuitive, way of thinking. I love the fact that architecture is an artistic discipline with very real constraints. Size has never mattered to me. You could do something incredible in a piece of furniture. A temporary experience is almost more difficult than a permanent one. I’ve always functioned best when there’s something to push against. Whatever project I’m working on, I immerse myself in each new world. That might mean researching the culture or reading up on relevant literature. You come out of every project changed. You just learn so much. What’s currently exciting you in design, architecture or style? Australia is an exciting place for architecture because of the expansive landscape and what that allows for private houses. That genre has really exploded. I love the varying characteristics of different areas – for example in Melbourne, inner-north Fitzroy (first three images, above) as compared to St Kilda (above) with its proximity to the sea. Which design era, building or interior has influenced you the most? The Centre Pompidou in Paris (above, by Richard Rogers and Renzo Piano) is one of my favourite buildings because conceptually it’s so groundbreaking. The Pompidou changed forever the way we look at museums by being fabulous and yet taking away the pomp. It also totally regenerated the area. Like the Sydney Opera House, it became a national icon recognised around the world. The value of it is incalculable. 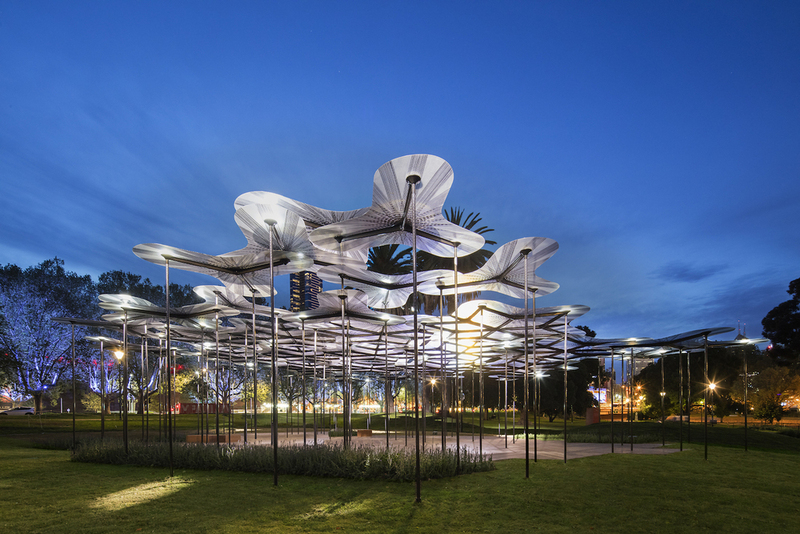 MPavilion is at Queen Victoria Gardens, Melbourne, opposite NGV International, from 5 October 2015 to 7 February 2016. Entry is free with a café kiosk run by Three Thousand Thieves. For more on Amanda Levete's 25XDesign project check back with the Fizz this Wednesday 7 October. Photo credits: Amanda Levete portrait copyright Peter Guenzel; MPavilion by John Gollings; V&A copyright AL_A; Sydney Opera House at Dawn courtesy of Sydney Opera House Trust; Centre Pompidou, Fitzroy and St Kilda by Sophie Davies. What inspired you to launch designjunction? We were frustrated by trawling around soulless traditional exhibitions and saw a gap in the market. Central London was missing a commercial show with creative energy. The big international brands had been absent from the UK for years, and we wanted to provide a platform for a curated selection of design labels to showcase in a more expressive environment. Your CV's not too shabby – how did you get to this point? I started working on the London Art Fair and New Designers exhibitions – which I’m still passionate about. I then launched the HOME department with Greenwich Village at Selfridges department store, establishing relationships with global brands such as Tom Dixon, Moooi and Edra. It was a great period in my life, working at the cutting-edge of design. It was through that connection that I went on to work for Tom Dixon. When I launched West London group show The Dock for Tom in 2009, I handpicked the brands and got them excited about taking part. I went on to organise London shows Superdesign and the Tramshed which were the start of something even bigger. How do you make designjunction fresh and fun to visit? By adding new features, such as flash factories, exciting eateries and fresh global brands, and tapping into trends. Another important aspect is collaborating with teams from the design scene. Our creative director, designer Michael Sodeau, refers to the show as a mini city within the Sorting Office. The ground floor is like Shoreditch or Camden with lots going on. The first floor is more refined like Covent Garden. The second floor has avenues and bigger stands, like Bond Street. Each area has a particular feel and energy. What’s in store at EDIT by designjunction in Milan? We are excited to have secured Palazzo Morando as our venue this April, a spectacular 18th-century costume museum in the fashion district. We have an international line-up of from British design brands Innermost and Modus to Parisian contemporary furniture label Adentro, Hong Kong-based EOQ and New Zealanders Resident. There’ll be lighting installations and commissions from Italian experts Baroncelli, and exquisite bone china tea sets from British ceramics brand Flux. Florence coffee connoisseurs La Marzocco will host a bespoke café in the courtyard and SodaStream and Yves Behar will curate the bar. Which collections will wow us? AfghanMade is presenting impressive rugs from designers including Christopher Farr, Matt Camron and Michaelian & Kohlberg. Sir Kenneth Grange has created a brand new sofa collection with Smith Matthias for Modus, which will be shown alongside a new chair by Michael Sodeau. Adentro’s launches star a new armchair by Carlo Contin and the ‘Cosimo' desk by Marco Zanuso Jr. Michael Young is presenting a fresh lighting collection for EOQ, as well as his 'Yi' chair. Resident is also debuting nine products at the show. Which trends are exciting you in design, style or music? The emergence of digital technology in design – augmented and virtual reality – which means customers can engage with products anywhere in the world. For instance, Dezeen is bringing its augmented reality watch store to our Milan show. Customers can try on virtual watches by wrapping a paper ‘marker’ around their wrist and looking at a screen. They’ll then see the watches modelled on their wrists in real time. Brands such as Alessi, Vitra and Serralunga have already experimented with the Sayduck app, a virtual showroom platform that brings products to life, allowing you to experience them in 3D with all the size, material and colour options so you can envisage them in your home. Where's on your travel wish list? On the work front, we're looking at New York, and emerging markets in Mumbai, Shenzhen and even Turkey. Personally, I'd love to go back to South Africa for its fascinating culture, wineries and wilderness. If you hadn’t been involved in design, what might you have done? At university I learnt how to DJ. I lived with a group of guys and we used to organise club nights in Manchester. At the time the club scene was thriving and there weren’t that many girl DJs around!